Do you have the winter blues? Escape the cold dreary winter by heading to Hendricks County for a swim. That’s right, I said swim, indoors that is. You probably have heard of Splash Island in Plainfield, Indiana, for summer fun, but did you know that Splash Island has an indoor water park inside the Plainfield Recreation and Aquatic Center? 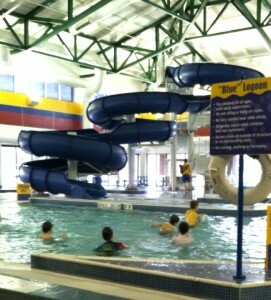 The indoor water park is one of my family’s favorite winter escapes. While we are there, we can forget about the cold outside and feel like we are on a vacation somewhere far south. 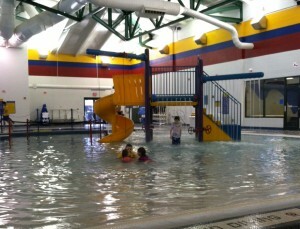 Splash Island Indoor has something for all ages. My 5-year-old loves the interactive children’s play area that includes a small slide. It also has a Zero Depth entry, which always reminds me of a beach, minus the sand. For older kids and adults, a two-story water slide awaits and pool basketball remains a favorite. If you want to get exercise, there are three lap lines. But if you just want to relax, move along the gentle winding river. Even though I always stay with my daughter, I am at ease that there are several professionally trained lifeguards on duty at all times. Splash Island Indoor also is a great spot for birthday parties with party areas for your guests to gather before heading into the pool. I recommend booking far in advance, because high-demand times fill up quickly. So, grab your swimsuit and cure your winter blues in Plainfield. Just be sure to check the times below for public swimming. 11 a.m.-1 p.m. and 5-9 p.m., Mondays, Wednesdays and Fridays. 11 a.m.-2 p.m., Tuesdays and Thursdays. 1-9 p.m., Saturdays and Sundays. 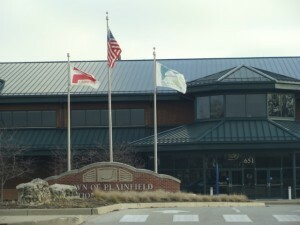 Adult Pass - $8.75 or $6.25 for Plainfield residents. Youth Pass - $7.50 or $5.25 for Plainfield residents. Preschool Pass - $5.75 or $4.25 for Plainfield residents. Senior Citizen Pass - $7.50 or $5.25 for Plainfield residents. "Just Watch&apos;in" Spectator Pass - $3.25. “Late Night” Evening Pass (8 p.m.-close) - $6.50 or $4.75 for Plainfield residents. Infants 1 and younger are free.